Hi everyone! I’m a Ford Sayre alum that many of you have seen kicking around on the Eastern race circuit for the last few years, first skiing for Dartmouth and then the Craftsbury Green Racing Project. At the end of last season, I decided not to continue as a ski racer, and so now I’m being forced to grow up and get a real job! Although negotiating municipal water and electric bills and not having my dad around to help me troubleshoot car problems has been a big change, it’s actually pretty fun, so here’s a little update. I moved all the way across the country to Eugene, Oregon, where I am working as a research assistant in the biology department of the University. I studied ecology at Dartmouth and did a lot of field research there, so it feels great to get back into science. It’s nice to like your job, but the best thing about Oregon is that there is a ton to do outside, especially in the summer. I have been on some amazing hikes up big volcanoes, a great backpacking trip in a national wildlife refuge, some summer skiing, and plenty of trail running. It’s a little strange after so many years of training to know that I am only getting more out of shape with every day that goes by, but I’m still fit enough to do the hikes and runs that I love so I can’t really complain. One of the most fun things I got to do this summer was the Hood to Coast relay, which I think is the biggest running relay in the world. It’s like Reach the Beach, but bigger – there are over 12,000 people racing! The relay is 200 miles long, and the twelve people on each team run three legs each. I managed to sneak in with a group of runners from Eugene and Portland and we had a great time. We all ran in red dresses and our team actually won the best costume award! I had the hardest leg because I claimed that I could run uphill… it was a good challenge and I actually ended up running two of my fastest 10k’s ever. That was a huge surprise and the icing on the cake of a weekend that was just pure fun. Now I’m looking towards winter, which won’t be very white in Eugene: it just rains all year, no snow. Luckily, though, the mountains aren’t too far away. A couple of my old Craftsbury teammates are living in Bend and I’ve already been over for a nice visit. I’m hoping to jump in a few citizen races as part of the XC Oregon squad, and I’m also going to be helping out with the high school team here. Since there isn’t any snow in town, it’s a lot of rollerskiing, running, and circuits during the week, with some trips to do real skiing on the weekends. A little bit different than the training I’m familiar with in New England, but the other coaches are really great and the athletes all have wonderful attitudes, so I think I’m really going to enjoy coaching. It will be nice to give something back to the ski world after being a giant sponge on society for a few years. Stay well, Ford Sayre, and I’ll miss seeing you on the trails this winter! 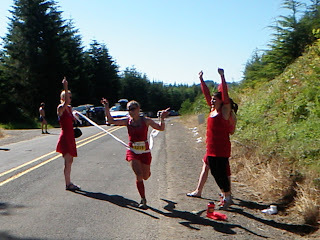 Hood to Coast: At the top of the hill on my third and final leg of the Hood to Coast relay – it felt like a victory even though the team was still hours from the finish! 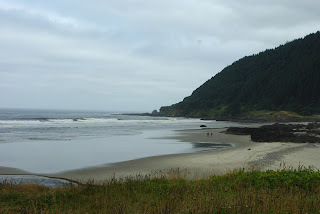 Oregon Coast: The Pacific Ocean is just over an hour from my house, and the coastline is beautiful, like a western version of Maine! 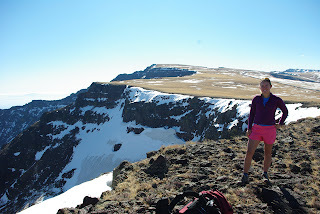 Steens: I did a three-day backpacking trip in a 185,000 acre wildlife preserve with a friend from college. There were big views. 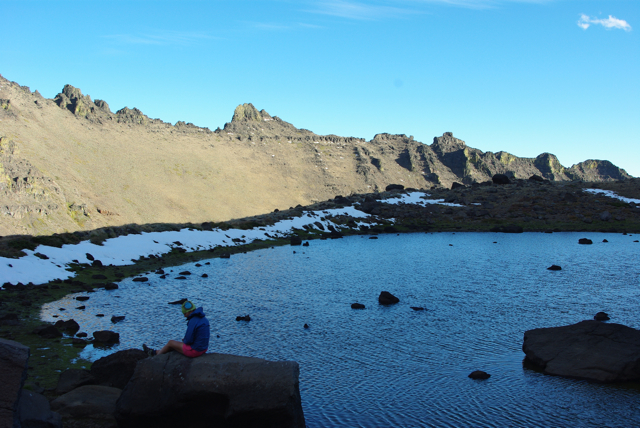 Wild Horse Lake: This was our camping spot on the second night: on the edge of alpine lakes overlooking a huge canyon, with jagged ridgelines in the background and not another person for miles. 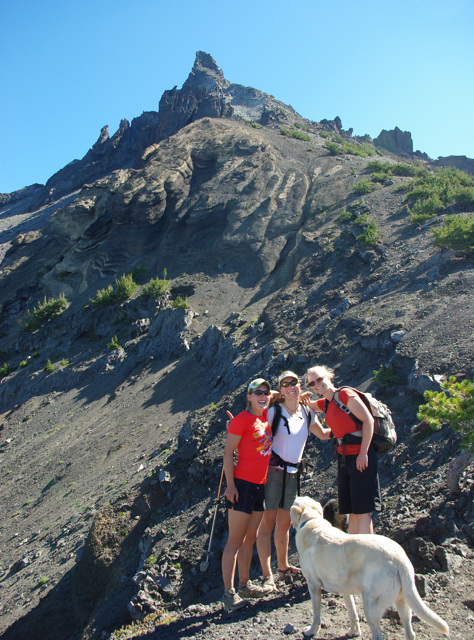 Thielsen: I did a fun hike of Mount Thielsen with some friends. It’s described as one of the “pointiest” mountains in the world and is hit by lightning more than any other peak in the Cascades.